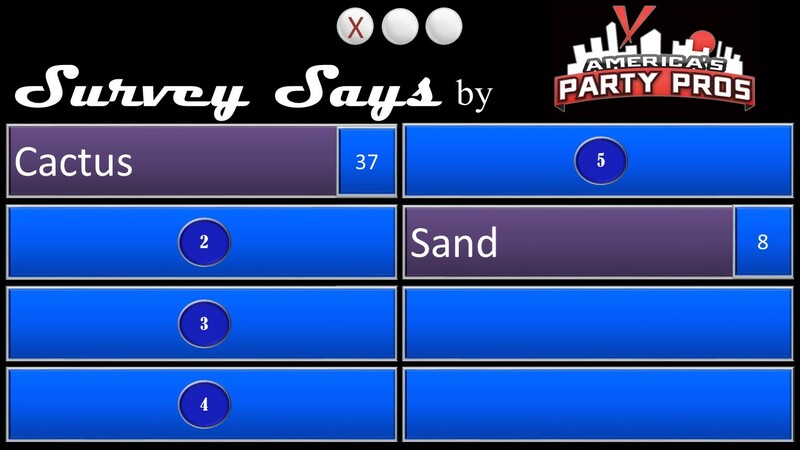 Survey Says provides a real game show experience in the style of Family Feud. This entertainment service is scalable to match different budgets and needs. Events with the budget to go all out with giant backdrops, interactive lighting, extra video screens for team names, and more can enjoy the added options while those who need to watch their budget can still get the core experience with interactive video screens, sound system, a working face-off podium, along with the great service from our hosts and technicians. Pricing currently ranges between $1,500.00 – $3,000.00 for a full package and staff to as low as $1,000.00 for a half package and reduced staff. Detailed package pricing coming soon. Sample Survey Says game board.